Ford just announced a new version of some of the vehicles that are most likely to affect our lives while being the least likely ones we'll get to drive: the medium duty commercial work trucks F-650 and F-750. Without them we'd drown in our own garbage while desperately wondering why there isn't any beer or Chex Mix to buy. 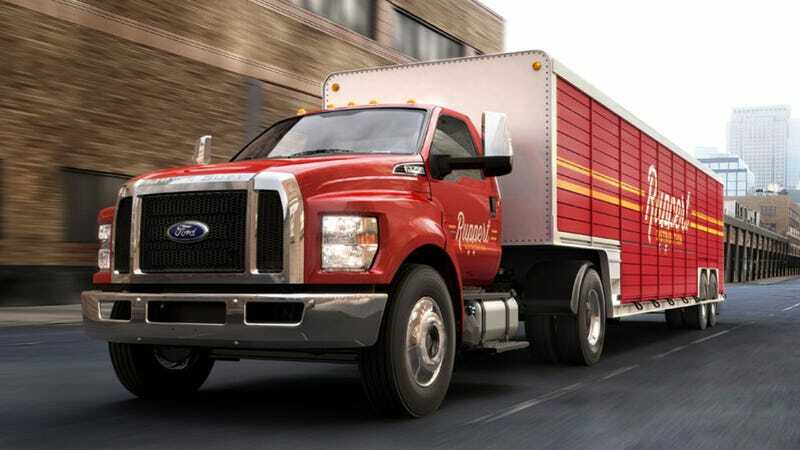 The newly redesigned F-650 and F-750 still retain the basic massive-bulldog/separate fender look Ford's used on their medium duty trucks since their 1980 redesign, but now with more attention paid to aerodynamics, giving a sleeker, more modern look. The headlights and indicators and front marker lights have all been integrated into one large unit, with the indicator stuck between the high and low beam lights like an amber patty in a big light burger. Ford's retaining its 3-section grille, with the outer two smaller sections referred to as "nostrils" by Ford, who claim they "improve airflow for optimal cooling performance." Also notable is the badging on the trucks, which Ford points out is in their "Bold Leadership" font. This is apparently the same font used on the F-150 badging, and a quick search I just did does not show the font available for download anywhere, but I bet that'll change soon. Power Stroke drivability is enhanced with tow/haul mode that includes a switchable integrated engine brake. The driver can regenerate the diesel particulate filter on-demand to clear out trapped soot from the exhaust system to help maximize performance. Intelligent Oil Change Monitoring is standard so oil changes are based on driving patterns and load demands instead of fixed distance intervals. Compacted graphite iron does sound impressive, I admit. And that diesel particulate filter "regenerating" thing — does that mean you can blow out a plume of trapped soot at will? Because that sounds pretty fun. Ford is also the only player in this segment to offer a gasoline/LPG motor as well, in this case a 6.8L V10. The fuel and other tanks (which are now aluminum) are now located under the cab instead of on the frame behind it, which should offer more flexibility for custom body/trailer applications. That means more room for your extreme-mobility RV you've been saving all that plywood for. Ford's also made a big deal out of their new robotic testing procedures, which allow for rigorous, difficult-condition and environment testing without making a lot of test drivers and/or horribly abused student interns exhausted and miserable. The video shows the rig in action, which seems to bolt onto the rear of the steering wheel and controls the truck via physical inputs, as opposed to any by-wire system. So, the next time your project car conks out on the side of the highway, pay special attention to that cab of the flatbed tow truck you're crawling in — very soon, it may be one of these new F-650 or F-750s.